With 75,000 orders taken so far Fiat’s new 500 is undeniably one of the most hotly discussed new cars of recent months - and one of the most successful. Its stylish retro looks, customisable design, high quality materials, 5-star EuroNCAP safety rating (it is the first car in the world under 3.6 metres to scoop this key award) and affordable price, have given the car an instant iconic status, resulting in an instant sales success. 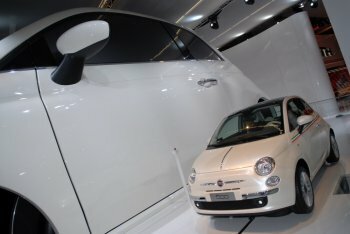 As Fiat CEO Sergio Marchionne put in in yesterday's investor presentation in New York where he announced the little car's bulging order book, the 500 is Fiat's "manifesto". He also revealed that jointly developing and building the car in Poland with project partner Ford has saved 40 percent of the expected costs of a 'standalone' scenario, which works out to a saving of 120 million euros. The 500, which is a firm favourite to scoop the prestigious European Car of the Year award, the most important automotive prize, when the final results are announced in November, has been so successful in fact that this year’s production has already been sold out. As a result the Fiat Group Automobiles plant in Tychy, Poland has plans to increase production capacity from 120,000 units to 140,000 units on an annual basis to cope with the demand. With increased production being put in place, the Tychy factory will roll out between 50,000 and 60,000 units of the Fiat 500 this year. During August the Fiat 500 enjoyed immediate success in Italy’s home market, with 2,388 units being registered making it the country’s eighth most popular car, and placing it ahead of several established strong-sellers including the Volkswagen Golf and Peugeot 207. 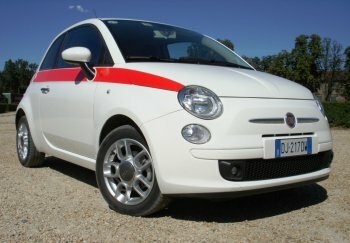 In the so-called A-segment, the 500 represented Italy’s second most sold small car behind the Fiat Panda at 6,934 units. The Fiat 500 was commercialised in France on 14 July (coincidentally Bastille Day), battling head-to-head with the new Renault Twingo which was also introduced this summer. Even in this most patriotic of markets, the Fiat 500 found 487 buyers in August, bringing the French year-to-date sales volume to 931 units. With 75,000 orders taken so far Fiat’s new 500 is undeniably one of the most hotly discussed new cars of recent months - and one of the most successful. This month has seen the 500 making its motor show debut at the Frankfurt IAA where a huge 500 'tunnel of love' has given visitors the chance to ride in the new car. This month has seen the 500 making its motor show debut at the Frankfurt IAA where a huge 500 'tunnel of love' has given visitors the chance to ride in the new car. Over the coming months Fiat are set to introduce the 500 in other key European markets. Next up is Germany, with the 500 going on sale from October 27. Spain, Switzerland, Austria and Poland will follow later on. This goes without mentioning the number of parallel imports made in a number of key markets where the Fiat 500 is awaiting official commercialisation. The little Fiat 500 is in fact so in demand, that certain car supermarkets in countries such as The Netherlands are stocking off-the-shelf examples at a 60% premium – quite literally more than double the price of the car in Italy. A quick search on the Dutch online trader sites shows entry-level Fiat 500s being offered from around €21.000 euros, whereas the official price in this market will be nearer €13.500. Other independent European buyers have ventured into Italy, importing the 500 privately. In order to cope with the demand, the Tychy factory has been running at full rate, with 5,330 units of the Fiat 500 being produced in August. Since the start of production 17,714 units have so far been built. The practical Fiat Panda still remains the most-produced car at this essential factory, with the year-to-date figure at some 171,000 units, followed by the Seicento (25,400) and the new 500 (17,700). One of Fiat’s incentives with the Fiat 500 marketing was the Baby Boom contest, a chance for expectant mothers to win a brand-new Fiat 500. Fiat announced the conclusion of the contest a few days ago, with a total of 3,943 participants signed up for the contention. The lucky winner’s name will be announced by October 15.